EM-1® Mikro-organismo Efektivo, e kultura-mama original segun Prof. Dr. Teruo Higa. EM-1® ta e solushon original, den kua e mikro-organismonan ta presente den forma líkido. Por us’é puru, pero mas tantu ta meskl’é ku awa i melasa pa multipliká (rende) i traha e asina yamá EM-A (EM Aktivá). Kon pa traha 10 liter di EM-A? Disolvé ½ liter di melasa + ½ liter di awa kayente den e hèmber. Agregá ½ liter di EM-1® i meskla bon. Kaba di yena e hèmber ku awa di pos òf renbak te un kantidat di 10 liter. Ku esaki bo a traha un meskla di 5% EM-1®, 5% melasa i 90 % awa. Sera e hèmber i sey’é hermétikamente. Yena e bòter di pòp ku awa i kolog’é na e hèmber. Hinka e slang di e waterslot den e bòter. E awa ta pa evitá ku oksígeno ta drenta den e hèmber. Asina ta permití e gas (CO2) sali for di e hèmber. Despues di 7 te ku 10 dia e EM-A ta kla pa uso. E tin un holó i un sabor zür. Si e ta smak muchu melasa, bo tin ku lag’é para mas. Midi e asides ku un strep indikadó di pH. Mas abou ku 3,3 ta hopi bon. Riba 4,5 no ta bon. Si bo purba e EM-A bo ta sa kon e mester smak pa otro bia. Bo mester warda e EM-A den bòter di plèstik na un lugá fresku i skur. Ta mihó pa usa diferente bòter chikí en bes di un bòter grandi pa manten’é fresku. Pasobra kada bes ku bo habri e bòter, oksígeno ta drenta. Mester usa e EM-A denter di 4 pa 5 siman. Despues di esei e ta pèrdè su efektividat. Pa limpia bentana, kushina, baño, ophetonan sushi. 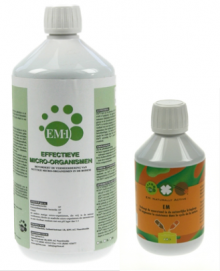 EM1® Effective Micro-organisms, the original mother-culture according to Professor Dr. Teruo Higa. Put the molasses in the bucket and mix it with ½ liter hot water. Stir thoroughly for all the molasses to dissolve. After that add ½ liter of EM-1®. Stir this thoroughly as well, in order for it to mix well. Finally, you fill up the vessel with well or rain water. With this you’ve made a mixture of 5% EM-1®, 5% molasses and 90% of water. Seal off the bucket with the water seal. Fill the water seal with water (so no oxygen can get in and no CO2 can escape). Put the bucket away from sunlight (approx. 32°C is the ideal temperature). At lower temperature the fermentation will take more time. After 7-10 days your AEM will be ready for use. The smell and taste are sour (if you can still taste the molasses, you’ll have to leave it for a longer period of time. You can measure the pH with a pH-indicator. Dip the strip in the AEM and compare the color of the center compartment (without number) with the colored compartments. Lower than 3.3, is excellent. Above 4.5 is not good. When you taste the AEM, you’ll know for a future time how it’s supposed to taste. AEM has to be stored in a dark place in a closed plastic bottle (not in the refrigerator). Use the AEM within 4-5 weeks.